So, it’s actually been a few weeks but I never remembered to take pictures until this weekend. The contractors are all finished and it’s in working order. It’s not done but I don’t know when it will be, so it’s done enough. So I guess I had posted about the walls being removed…we were just waiting on carpeting and now we have it. 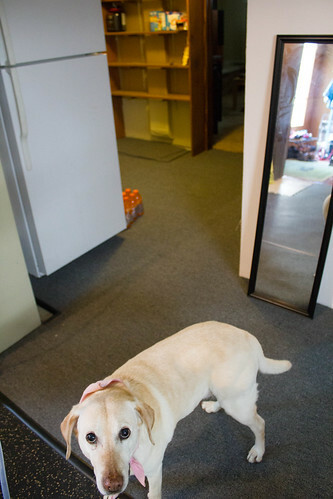 from the bathroom door back toward the office…can you spot the daisy? hey carpet, you’re pretty. hey furnace, you are hideous. There are still two tiles missing in that back corner, that door needs to be shaved down in order for them to fit. I want to just take the door off but Keith wants to keep it on since we can hide a garbage can behind it. That tube hanging from the ceiling is the bane of my existence. It comes from the A/C (?) 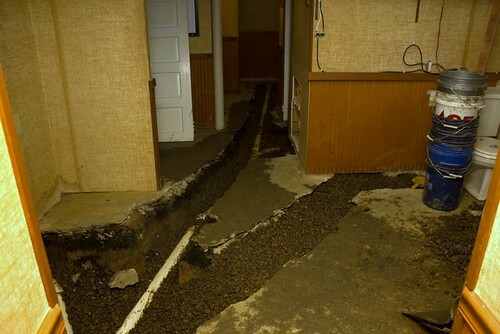 and has to go into that drain in the floor. Before, there was a wall there, so the tube ran along the wall, but now it’s just hanging out. We drilled holes into one of the mats so it still works as a drain, but I have already tripped on it/nearly pulled it out once, it’s only a matter of time before it happens again. Luckily the mats aren’t glued down or anything. There has to be a better way to have it, but I am clueless. daisy is usually not such a photobomber. she must have felt pretty that day. the grey carpet is a nice transition to the black speckled mats. the old 3rd office looking out to the gym. keith bought all sorts of manly artwork. what was the 3rd office, what will be keith’s closet. 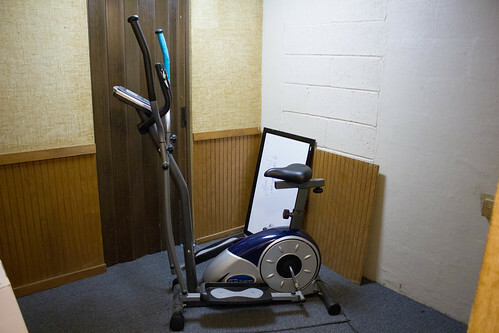 There is a door in front of the elliptical that leads to the gameroom. 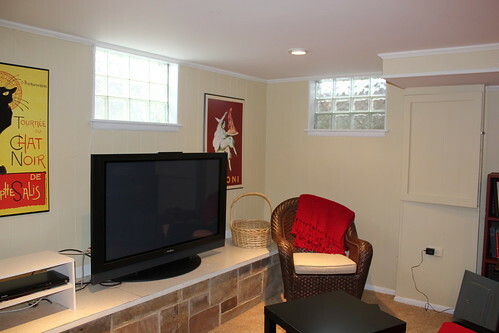 If you open the door, you get a straight shot at the tv. 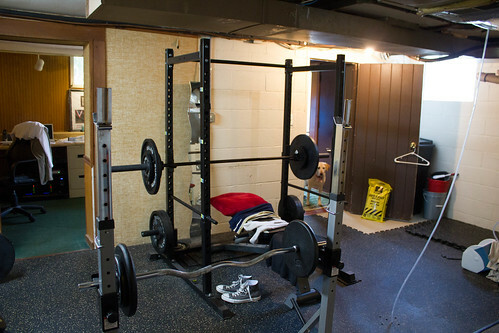 Keith has too much weightlifting stuff, the elliptical would just take up precious room for how infrequently I use it. Daisy modeling a close up of the carpet. Since the floor is so uneven there is a really thick carpet pad under there so it’s nice and squishy. 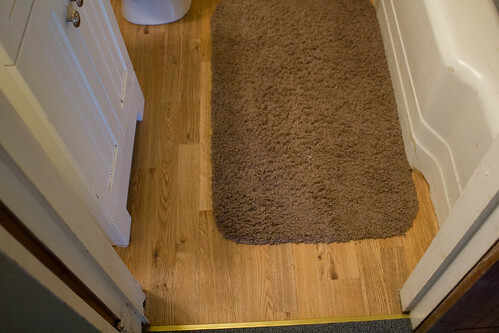 We also got new flooring in Keith’s bathroom…it was gross carpet before. I wanted to go with small tile but the contractor suggested vinyl. We saw this and it looked pretty nice, so we went with it. 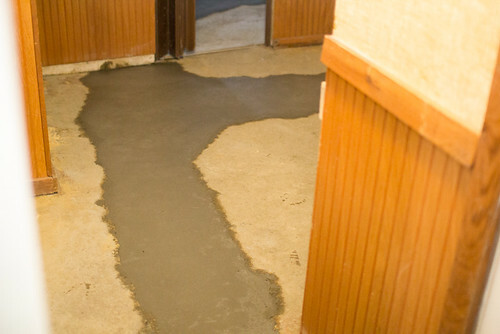 And considering it took the contractors* a month to get this all done, I’m sure I’d still be waiting on the tile. So, that’s where we are now. 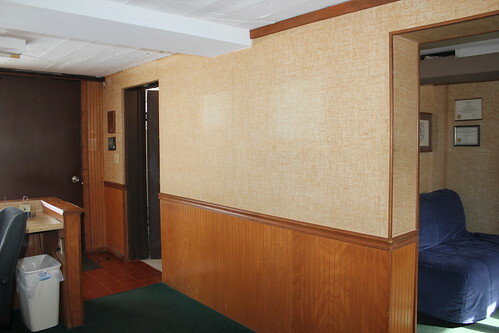 I still want to try to rip down or cover up the disgusting burlap that is on half the walls. 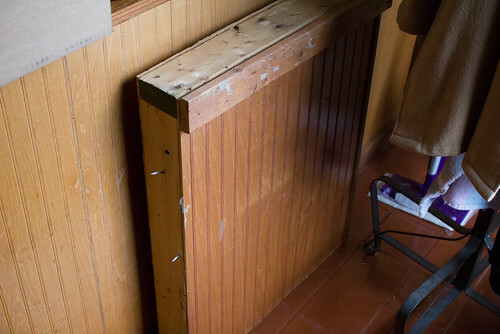 I still haven’t decided if we should rip down the rest of the wainscotting or put up the rest…it’s sort of a 50/50 split now, it would be easier to rip it all off, but it would look nicer to put it all up. I also would like to do something with the ducts/ceilings, they look terrible. I am hoping I could paint the ducts, but there are all sorts of holes in the sheetrock (?) of the ceiling. It looks bad…but on the other hand, who is really looking at it? And painting of course. 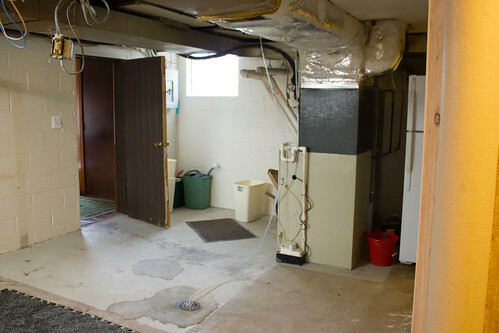 I want to do the basement and Keith’s bathroom a nice pale blue. The yellow down there has got to go. But I also have 10 million other projects for now. 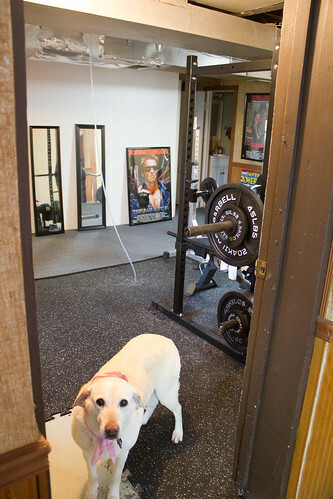 Keith doesn’t care what it looks like while he’s pumping iron. *We used a Kress Brothers, and I don’t think I would recommend them. 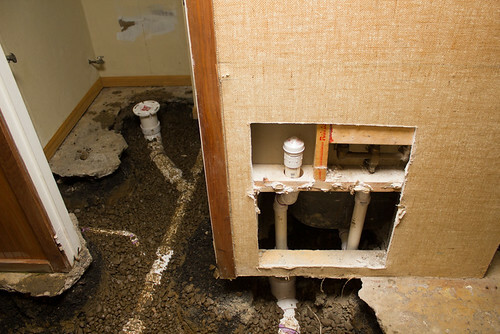 Everything was done well, but since they use subcontractors it took an entire month. It felt like someone would come and work for 30 minutes and be done for the day. 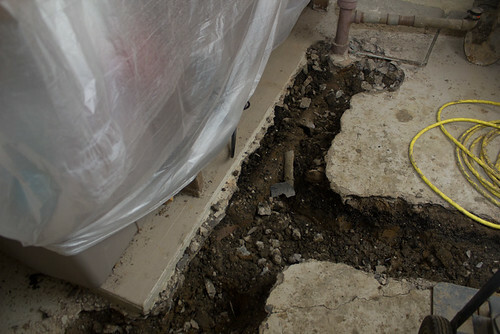 Luckily we have no big contracting plans for a while, so we’ll find someone else for next time. 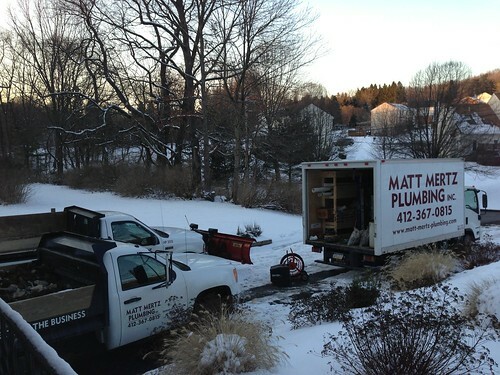 I still whole heartedly recommend Matt Mertz Plumbing, though. 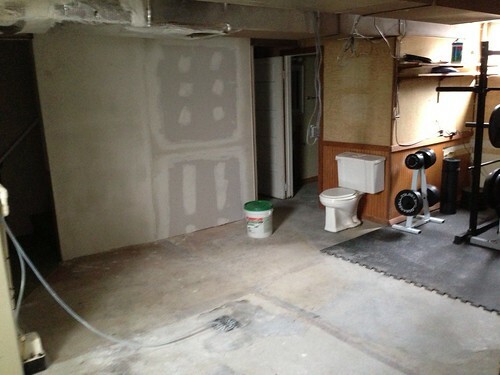 They ripped up, replaced and redid our entire basement in 3 days. 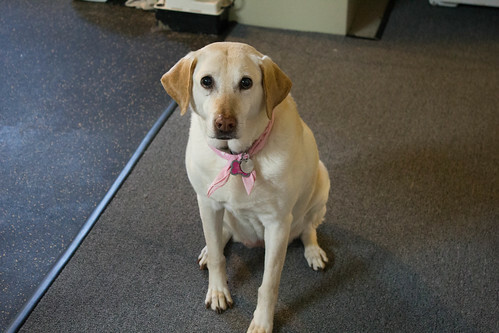 here’s another Daisy photo for good luck. She would like to tell you that although she looks a little plump from this angle, the camera adds 10lbs and she suggests you redirect your attention to her stairs photobomb where you can see her tiny waist. 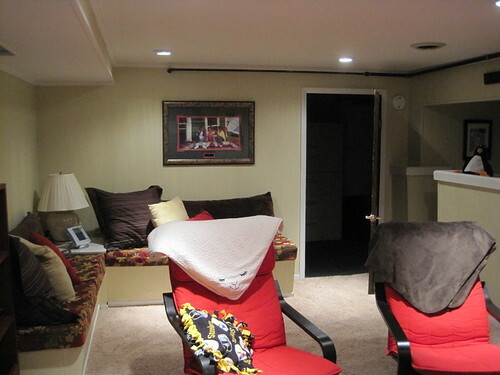 more basement! now with less carpet! I’m back with some better pictures of the basement. view from office – the carpet will go all along that wall, back to the bathroom and then back to the left into that other room. which will become keith’s closet. 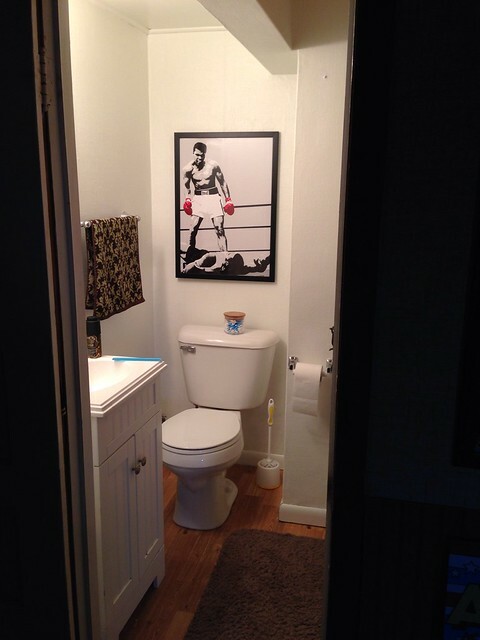 from bathroom, we are debating about removing that door. They ripped up the carpeting yesterday. 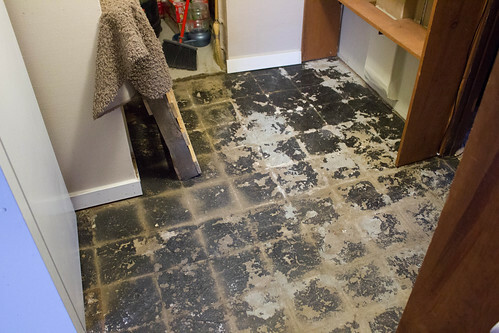 I didn’t know the floor could get any uglier…but it did! 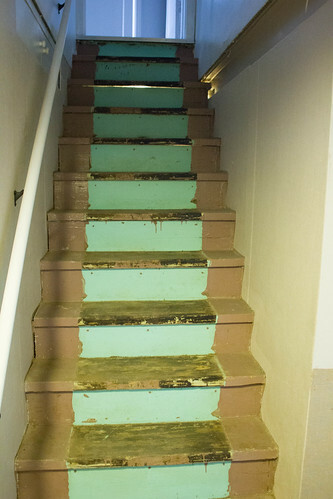 i do kinda dig the original color of the stairs! 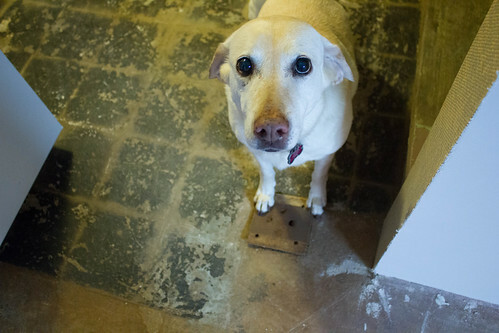 i was trying to take a picture of the weird metal plate on the floor, daisy so kindly modeled for me. We chose our carpet last night, we went with a medium grey color. Hopefully that will hide dog hair better than the dark green did! Daisy has been spending the day at Keith’s parents’ house so she is not disturbed by the men and yesterday I went to get her and set the burglar alarm off. Because of course I did. Luckily I was able to shut it off quickly enough that no one came to arrest me, but uuuuuuugh. So, the contractors came yesterday and knocked down some walls. and the walls to the left and straight ahead. I had class last night, so Keith texted me a few pictures when he got home. I didn’t get home til after 9 and was not dragging out my big camera, so iPhone photos, it is! The view from the office. Those lines in the concrete show where the walls were. Hello random toilet. The view from near the toilet. 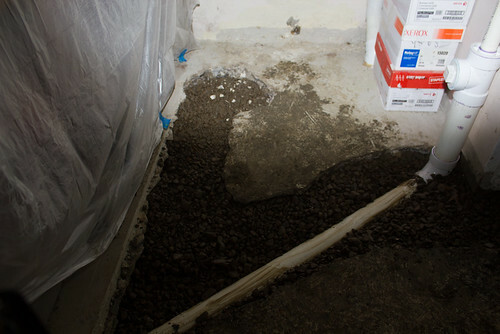 The rubber mats in the bottom corner will extend all the way to that far wall. A panorama. I always forget this capability exists on my phone, glad Keith made use of it. 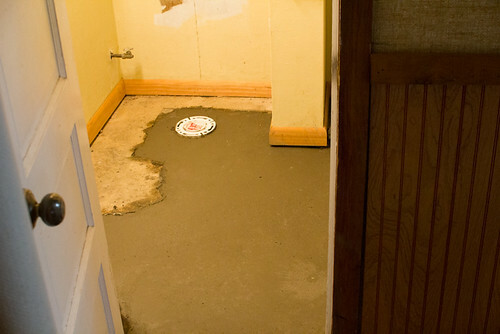 They are there again today-Friday, I believe putting down the bathroom floor today, they left some carpet samples for us to look at tonight, the carpet will go where the toilet is, along the rubber mats. I am slightly annoyed by two things. I didn’t realize we had to deal with both burlap and cinderblock on the far wall…trying to paint it and make it not look ridiculous is going to be interesting. There are electrical boxes and lightswitches hanging from the ceiling. They were in the walls that were removed. 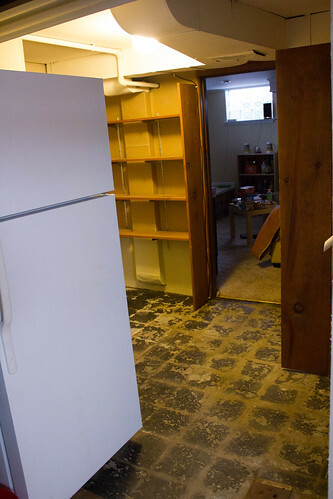 I assumed they would be moved into the existing wall before they drywalled, but they were not. I guess they could be putting them in after the fact or something…I don’t know. I do know that if they finish and there are still electrical boxes dangling from the ceiling, I am going to be very angry. 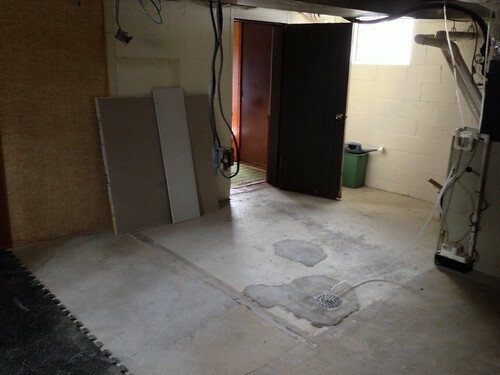 From the pictures Keith sent me the basement looks HUGE, but in real life it is somewhat less impressive. Now that the air ducts and the furnace are more exposed, the ceiling seems lower and it seems like the furnace is in the middle of the room. I plan to paint the air ducts white so hopefully that will help them blend into the ceiling a bit better. There’s no hope for hiding the furnace though. 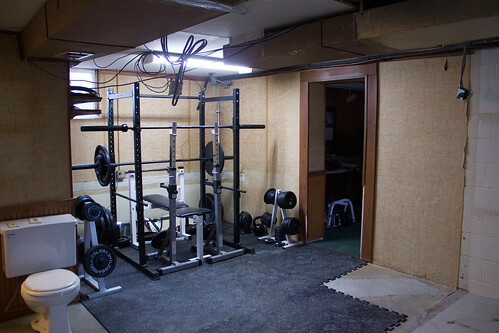 Just a quick post about the basement. The contractors (oddly enough, our old landlords) are coming next week to knock down some walls! 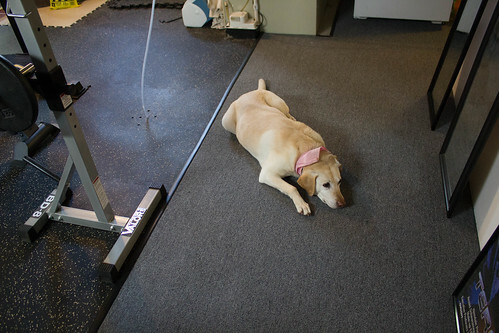 I think I mentioned in the last post that Keith bought rubber matting for part of the floor, while I was in Minnesota, he started to put it down. The mats are pretty cool. Thanks to the flecks, you can hardly tell where they connect, it’s pretty seamless. 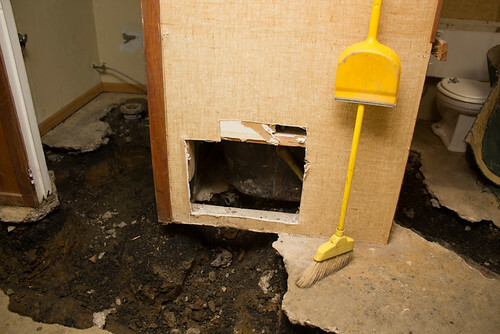 A couple of days after we got the floor fixed…this came in the mail, so now the room looks like this. Keith is slightly obsessed. If the contractors come and make him move everything out, I get to say “I told you so,” but at least he gets to make use of the room for the time being. 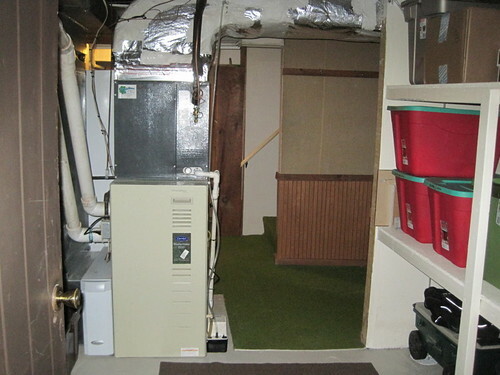 I can’t waaaaaaait to see what this basement looks like once they rip those walls down and we get new carpet. And eventually I get to paint. It’s going to be awesome. The longer we live here, the more basement Keith takes over. 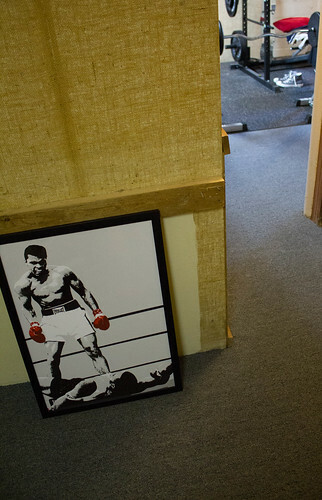 It is really turning into the man cave. Which is fine, since I get the top two floors of the house. Please excuse the MS Paint rendition. I haven’t had time to sit down on the laptop with Photoshop, so I just made this in a few minutes at work. Here is floorplan of the affected areas and our plans. The game room is not being touched, I just labeled it to give you a better idea of how everything is laid out. The grey squiggles either currently have that gross green indoor/outdoor carpet, or none (since it was ripped out). It will be replaced with carpet. Hopefully grey. 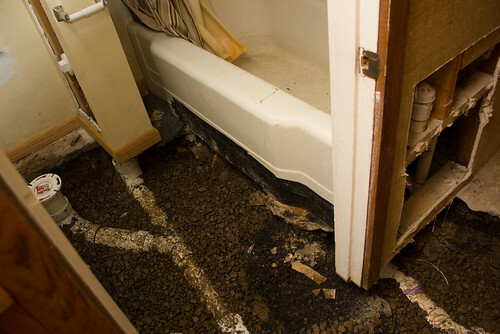 The bathroom will be getting new flooring. 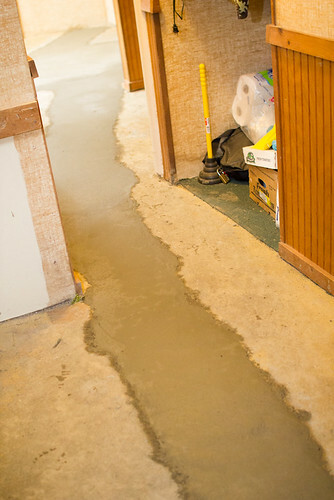 I wanted tile, the contractor recommended vinyl…we will see. 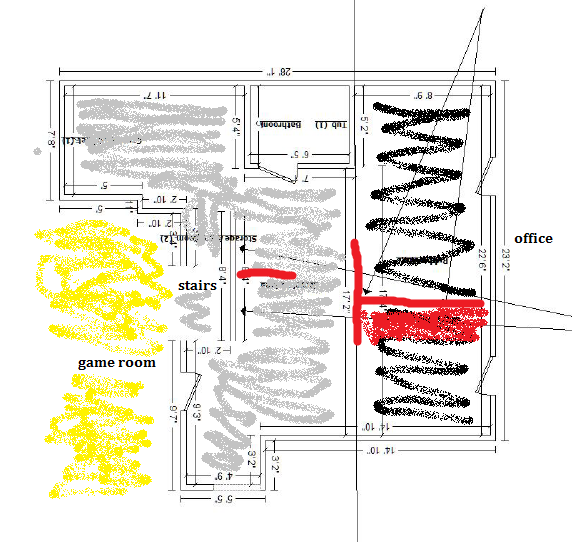 The red lines are current walls. The red squiggles are shelves. They will all be torn down. The top half of the black squiggles is the exercise room, the bottom half is the garbage can area…it will become all exercise area and be covered with rubber matting. Our estimate for all the repairs was pretty affordable, minus the matting. They quoted us 1700$ for the flooring and 500$ to install. He said if we found the mats cheaper, that was fine, it would still be 500$ to install. So Keith bought some for 800$ and we will install them ourselves. It can’t be that hard. (Famous last words). We’ll also be doing the painting ourselves. They gave us a quote, but I work cheaper than that. They also probably would just paint right over the burlap and I would rather do a skim coat of plaster first. 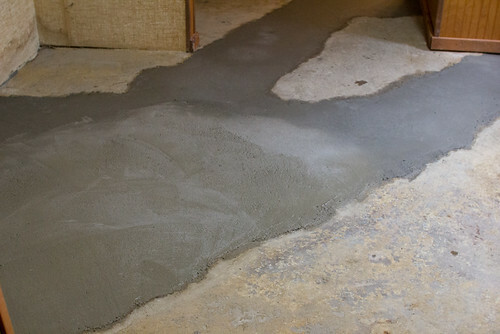 We can officially start putting floor down on Friday (30 days since the concrete was put down). We still haven’t heard when the contractors can start, but hopefully very soon. Eventually we’ll redo the office too but not yet. 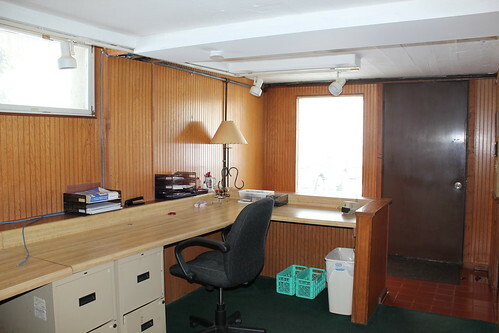 I am dying to replace that carpet/paint the wood panelling, get nicer filing cabinets, etc. 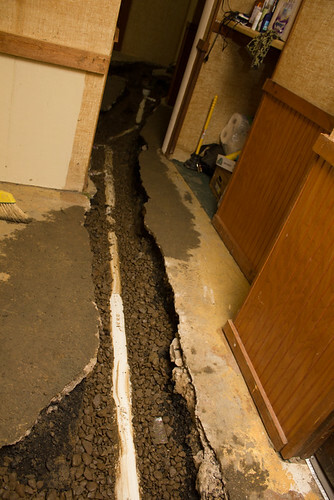 So the pictures I put up of the plumbing fiasco are the only basement pictures I’ve shared. 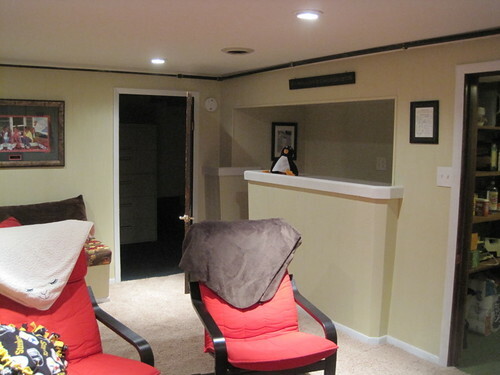 I guess I should do a before post on the basement since it has changed already and will be changing more soon. 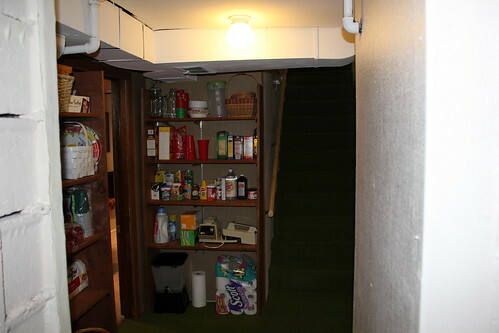 So hold on tight, because the basement is weird and you might get lost. There is a doorway off the driveway that leads into the basement. It’s the one that the previous owners did not leave a key for and I curse them for it daily. Upon entering is the office. 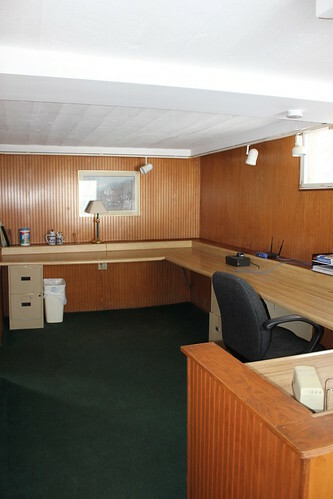 They used this as their business office, it used to be a one-car garage. We still use it as an office, but it is not nearly as tidy. This is looking back toward the door, that’s the Daisy window (aka the one window in the house she can see out). She occasionally barks at her reflection. The office is really cold. There is a big gas heater in the corner by the window. From the office, there are two doors. 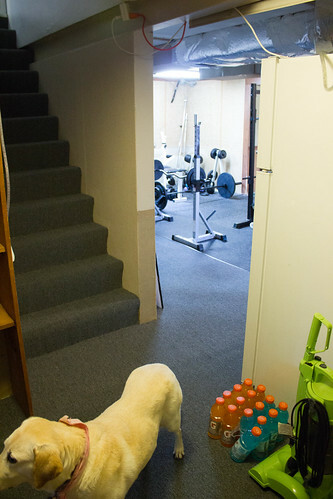 The door on the right leads into what we have turned into the exercise room. The door on the left leads to the furnace area. 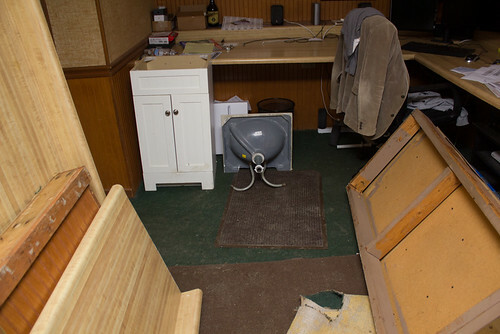 This was another office…until one day while I was babysitting, Keith ripped the desk out. On the other side is this weird little area in front of the bathroom. 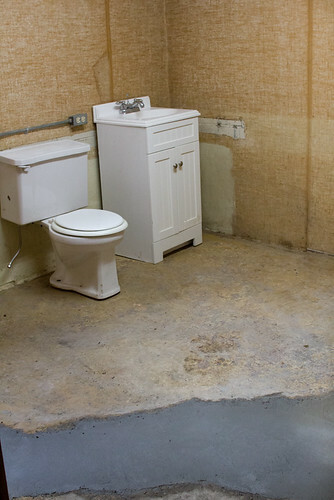 Very tiny bathroom. There is a tub to the right, I just couldn’t fit it all in the picture. Coming out of the bathroom is another shot of the weird little (useless) area. To the left of the bathroom leads into this office area. The plumbers ripped out that desk for us. And directly behind me in this picture is “the hole.” It looks pretty much exactly the same. Holey. and instead of taking the right door, take the left door…you see this. The furnace area. The room goes another few feet to the left and that is where the garbage cans live. 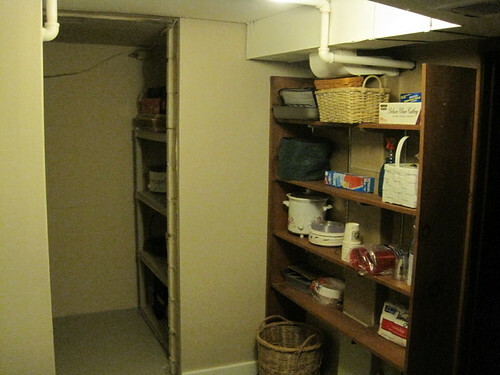 Further on with the stairs to your back, there’s some shelving and straight ahead is some more storage. 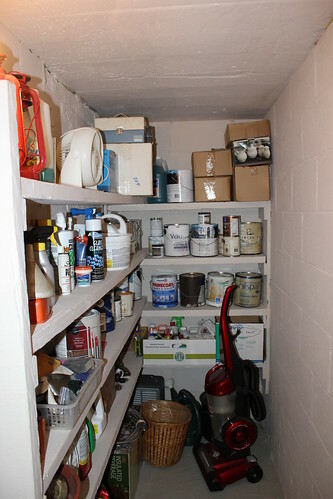 A lot of that stuff is still in there, I really need to clean it out/dispose of all that paint. Heading back out of the storage cave, the stairs are sort-of straight ahead, more shelves and to the left (that sliver of light) is the game room. This is the one room of the house that I haven’t touched and have no plans to touch. It is all Keith. Those benches are built-in. Sadly they don’t have storage. I offered to recover the cushions but Keith doesn’t care. We have a couch where those chairs are. And a bar. 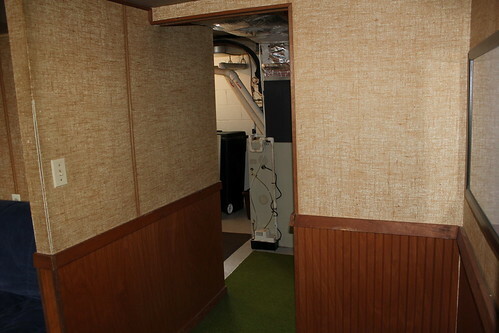 That open door at the back leads to the weird little office-y area off the hole. See, a labrynth. 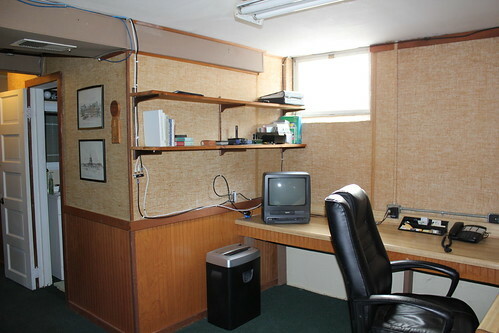 And can we talk about those burlap-covered office walls for a second? Like what even? Why? how? The bathroom has it also but it is painted over and still looks bad. 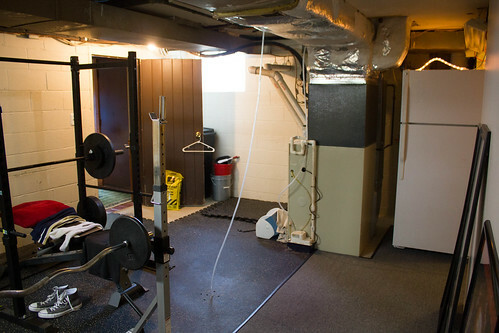 The whole basement sort of seems like an afterthought. Walls are just put up whereever and the division of space makes little sense. We got an estimate for some repairs/modifications but this post has gotten too long already so I’ll be back later and give a break down of what we want to do. 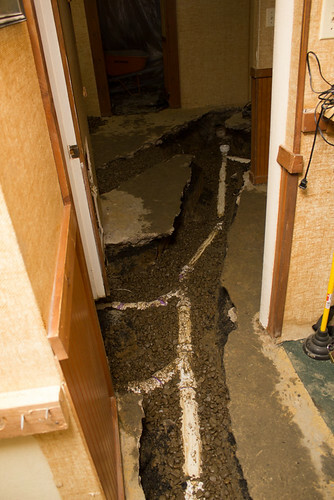 So, the plumbing was supposed to be finished on Friday, but when I drove past the house at 5pm, there were still 3 big trucks in the driveway. I got to Keith’s parents’ house and he was there and said that when he drove by (before me) there were no trucks, just a man. So we let the dogs out and decided to drive over to Lowe’s while we waited. Well, we drove back past our house and everyone was gone. So we went in and took a peek. The first thing we see when we walk in is this little half-wall and we still are not 100% on where it came from. It might have been holding up the desk in the little office? I really have no idea. To the left, the random little holes are filled. 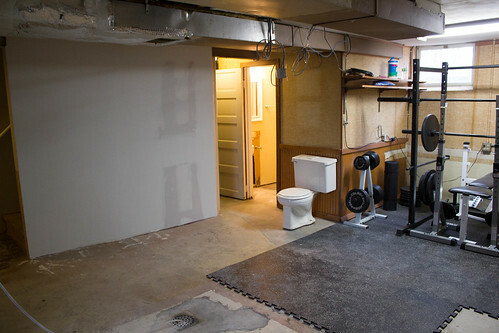 Big giant hole in the exercise room is gone. And the toilet and vanity have returned. 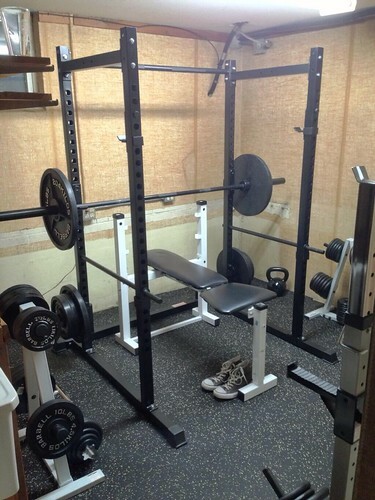 Not to their normal/usable space…but at least they are there. I jokingly told Keith we should write our names in the cement and now I regret not doing it. Since everything was still pretty wet, we decided to just spend another night at his parents’ house and come home in the morning. We went to Lowe’s and considered our options for the floors. We had mostly decided on going with a laminate, but were told there would be about a 30 day wait on the installation. 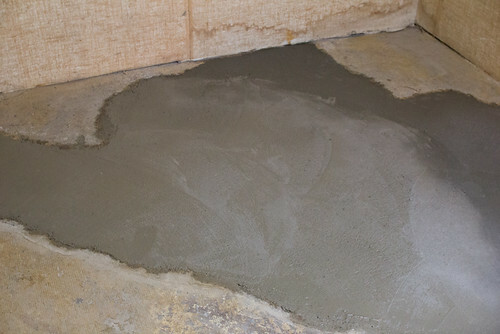 And moments later, Keith gets a call from the plumber informing us that everything is done and oh yea, cement takes about 30 days to cure. This project has gone from little to gigantic and it is pretty stressful. 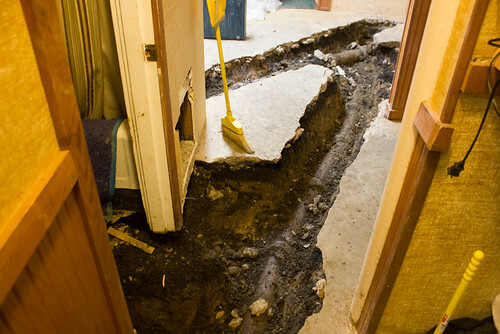 We don’t really HAVE to do anything but get a bathroom floor down…but if we want to expand the bathroom, there is no sense in putting a floor down first. Ahhhhhhhh. Keith has to talk to the insurance adjuster tomorrow so he had offered to give us some recommendations on people to go with, so hopefully he can recommend a contractor that we can come by and just give us some sort of estimate. Again, so thankful all this crap is just in the basement. We still have a fully functional house…it’s just really annoying. So Thursday was day 2. I snuck down in the morning to take pictures as I stated before. They were actually gone by the time I passed Thursday evening, so I got to go in and take my Day 2 pictures. Keith had gotten a call Thursday, that instead of finishing Friday like they thought, it would take until Monday. I was not really surprised. Three days in and out seemed way too good to be true. 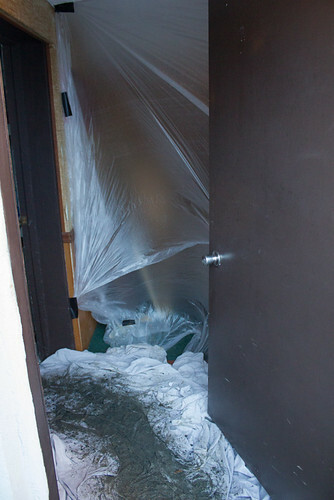 So we walked into the house Thursday evening and were immediately hit by the horrible smell of PVC pipe. Oh man, it was awful. 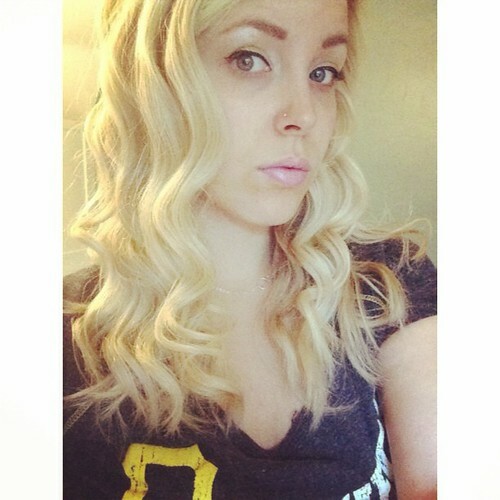 Chemically and overpowering. 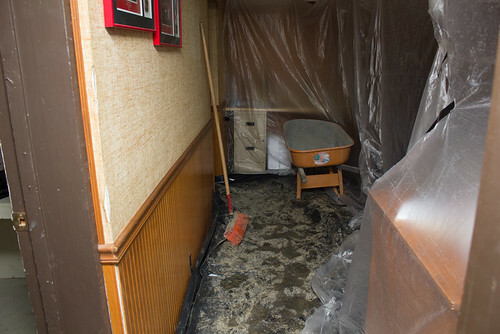 Everything behind plastic, thick muddy plastic on the floor, countertops gone for good, sink and vanity…where did you go? No, really, where did you go. I don’t remember seeing you. Ooohhh look at that shiny white pipe! Anybody need any rocks? 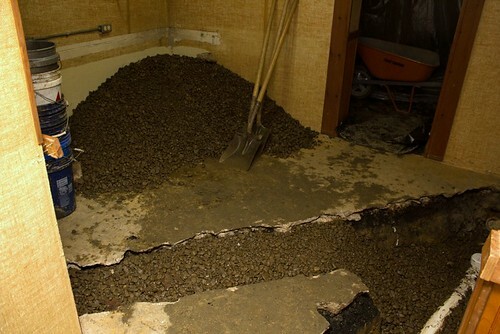 I guess I didn’t expect them to fill the holes with concrete, but I was kind of surprised to see a big ol’ pile of rocks in my basement. Just realized that pipes are going a different direction now. Weird. 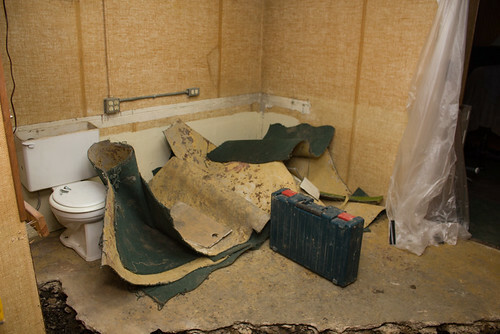 Also a shot of the crappy tub. 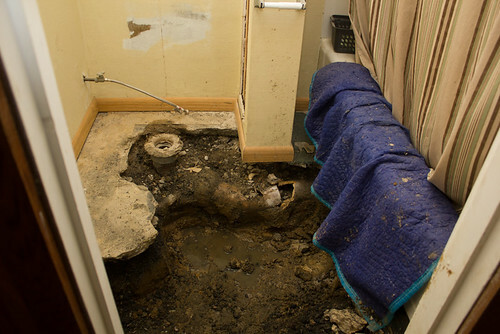 Apparently we are getting a new toilet because it would be more work to replace the old one? (Um, okay, sounds good to me!) I wish they would have broken the tub or something and replaced that. We’ll have to replace it ourselves one day. The hole. A little more pipe rearranging here. Looking back toward the office. Nice new pipe! So later that night, Keith got a phone call and the guy said he was back on the original timeline and they should be done today! 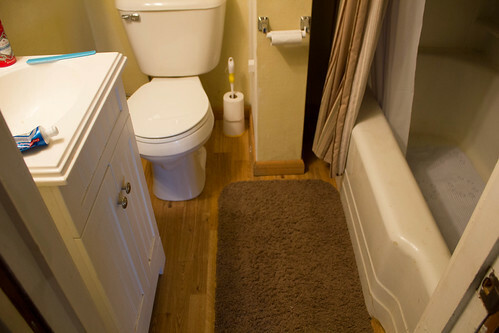 Except the toilet and the sink can’t be replaced until we get some sort of flooring in the bathroom. We were going to try to wait on putting down any flooring in the basement since we still aren’t sure which direction we are taking it. There is a lot of awkward space down there that could be better utlized in other ways. 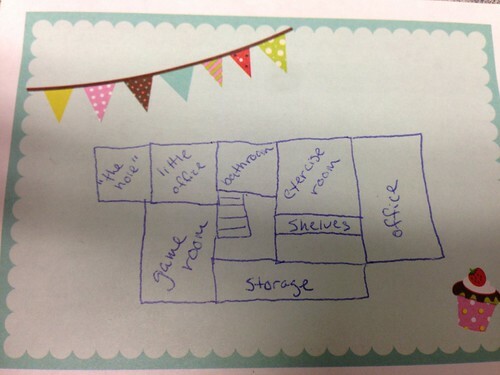 We had talked about expanding the bathroom (by using the little office) and putting some closets in there for Keith (since he gets ready in the basement). 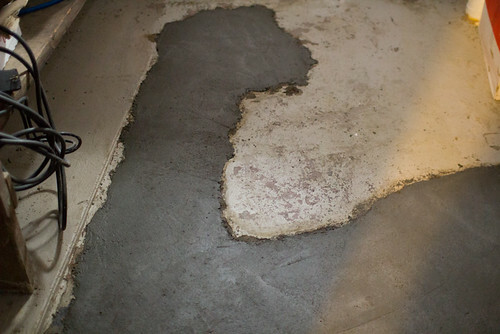 So it doesn’t make a lot of sense to pour lots of money into flooring when we might want to rearrange everything. 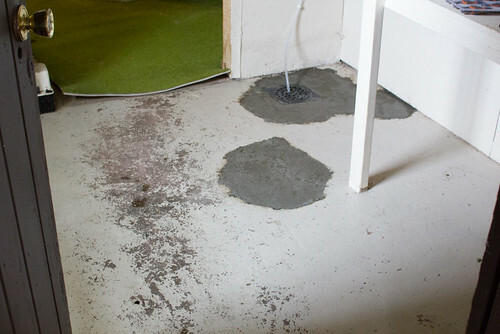 But at the same time, apparently we can’t just make do with concrete floors/rugs for the time being. So this weekend we are going to go price some things out and figure out if maybe there is a happy medium. So Wednesday was the day! Since I don’t think I ever shared pictures of the basement and it is a total labrynth, I drew a little diagram. On an adorable post-it. So, we thought the areas to be affected would be the bathroom (obvs), the exercise room and maybe the little area in front of the shelves. Haaaaaaaaa. Keith texted me at some point in the morning that the project was going to be a lot more involved than they expected. Which is just a wonderful thing to hear. You can hardly see, but the left truck was FULL of broken up concrete/dirt. I had originally planned to go in and take pictures, but obviously couldn’t do that with them still there. Keith stopped by a few minutes after I left and went inside He later informed me that it was wayyyy worse than expected. I decided I would sneak down Thursday morning before they got there and take pictures. So that’s what I did. This was the view that greeted me once I opened the door. Encouraging already, right? Once I peeled away some plastic, I was greeted by this in this office. Hello, sink and vanity! You do not belong here. Those are countertops to the left and right. 2/3 of them Keith ripped out of the exercise room and were just stashed in the little office til we could get rid of them. The other one was from the little office and the plumbers had to rip it out. I wanted it out of there anyway, so I was not the least bit disappointed by this. And Keith asked them to just throw it all away and they agreed, so that was a huge bonus since the other two had been sitting there for months (too big for either of our cars). And then here she is. Lovely. 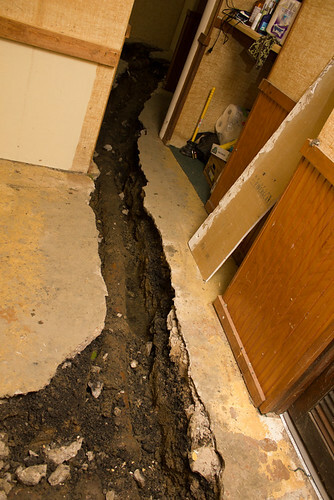 And another angle to show the enormity of the hole. 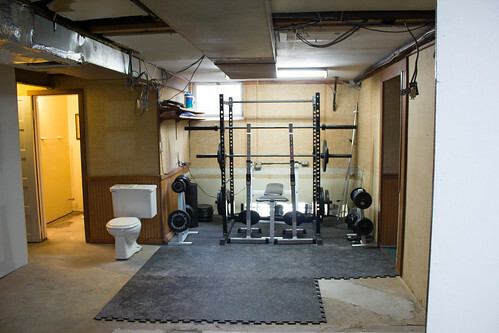 The rest of the exercise room. 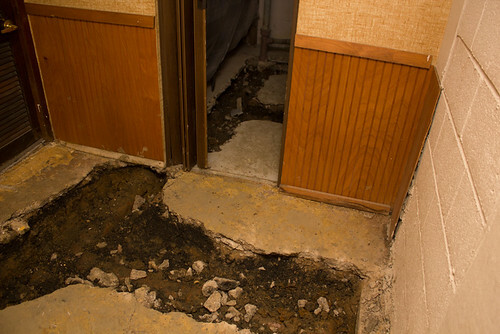 Old nasty carpets and old toilet. It was indoor/outdoor carpet and it sucked. I hate green and it shows EVERY single dog hair. They told Keith they were going to put it back, but he told them just to throw it out. You can also see the lovely state of the walls down there. That white strip is where Keith ripped the desk out. 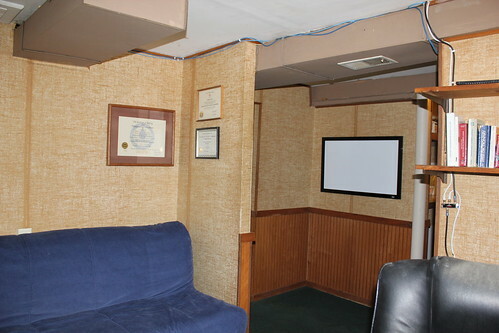 There is some sort of burlap glued to all the walls, but of course they put it on after the desk, not before. Another old house surprise. And then here we are looking at the bathroom. That giant rectangle leads to the tub. A better bathroom shot. Pretty horrible. Just to the left of the blue blanket, you can see a cracked pipe. 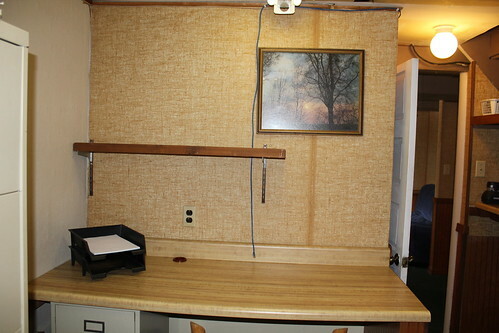 This shot is of the little office, I am standing where the old desk was ripped out. 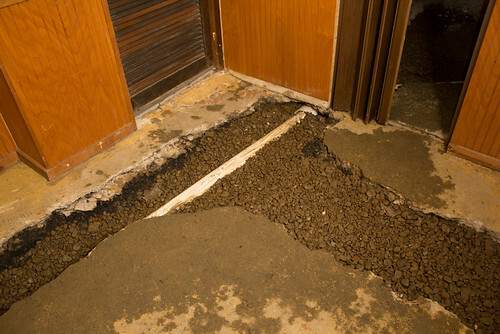 Through that folding door is what we call “the hole” and you can see they dug all the way into there. 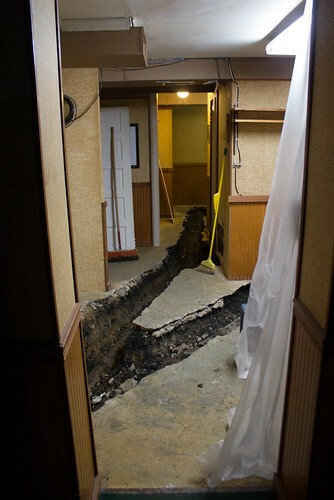 Closer shot of the hole. 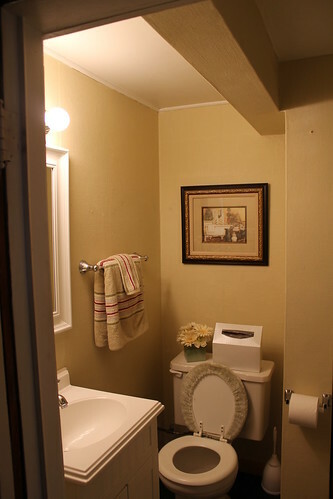 This is where the other two bathrooms connect to the main line. And then the view once I turned around, looking back toward the office. 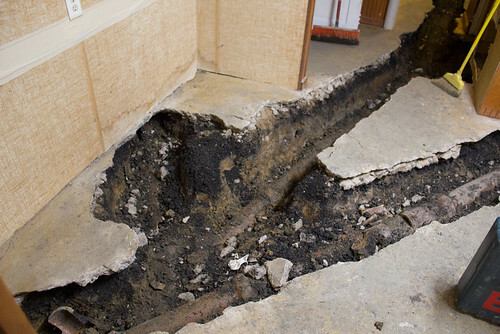 And a better shot of how that trench connects to the giant exercise room hole. 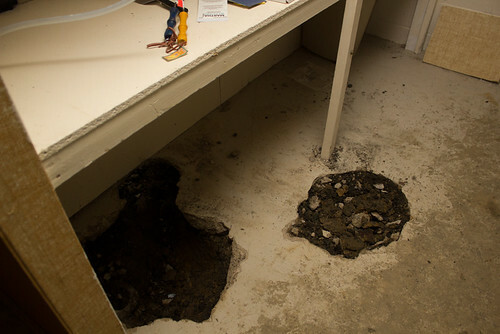 And then two little holes under the shelves, these must have been their initial holes before they realized which direction the problem was.